Ever get tired of buying the same old wine, from the same large producers, that are available at every wine shop and grocery store in town? Looking for something new and unique? 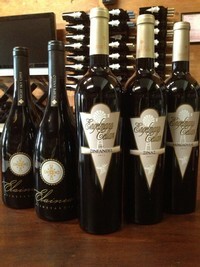 Well Engelmann's Cellar Door Club could be just what you are looking for. What do you get with Engelmann's Cellar Door Club? How about four shipments a year (February, April, August and November) of 4, 6, or 12 bottles of wine (you pick the level of membership) at 20% off retail plus CA sales tax. 2. You pay no cover to Friday Night Wine Tasting events May-Sept.
What does it cost? Absolutely free to join. There is a one year comitment (four shipments) when signing up. Just join below, and each shipment will be billed to your credit card, at the begining of the month on release months above. You may elect to pickup the wine at the winery and save the shipping, plus get a chance to see what is new. A notification email will be sent to let you know that we are holding your new wines. Same as the other 12 bottle club but you will only get red wine in your shipments.